Did you ever think to yourself “If only a time machine elevator existed….then I could change who I married and live a happy life!” than Marry Him if you dare is the drama for you! 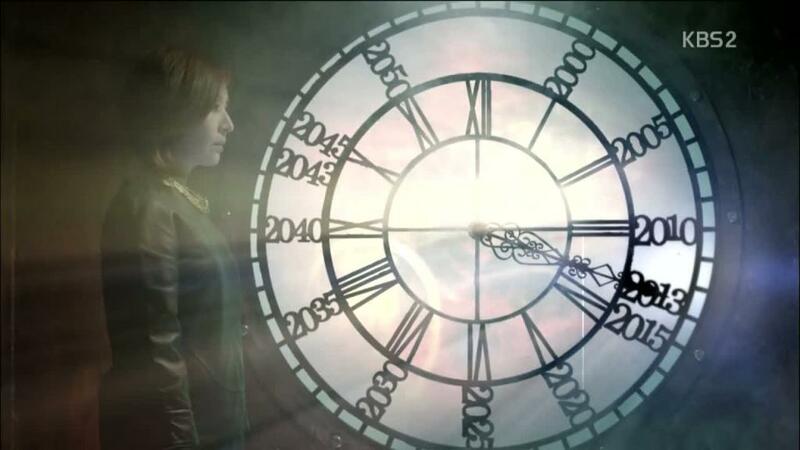 Yes – in fact there is a time traveling elevator in this drama. Nifty, I know. 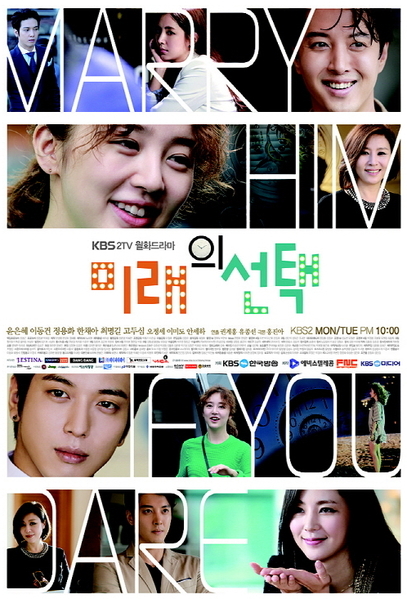 MHIYD premiered yesterday on KBS2 and is set to air for 16 episodes. I just finished up the first two episodes, and as expected I have some rambling to do. Cheers! Na Mi Rae works in a call center, taking calls from weirdoes while she watches television online. Her dream is to write for variety shows, however she is held back by her combination of laziness and lack of self-confidence. She lives with her Oppa, who is constantly urging her to move out and find a husband. She tries to put on a front of optimism despite her situation. A broadcaster, Kim Shin is served a major blow when he is removed from his nightly news anchor spot in order to host the morning show. He feels that journalism is a serious and multi layered occupation and is appalled at his employers focus on hiring young talent over quality journalists. Mr. Serious Kim Shin is trying to make the most of his new job, all while being a pain in the-you-know-what to his new production team. Se Joo is the heir to a conglomerate which includes YBS (the station that Kim Shin works at). He is currently working as a VJ, his true role as the heir to the company is unknown by the production staff he works with. Having met Mi Rae by chance (here is a juicy tidbit that sounds far more scandalous then it actually is – he met her because he filmed her naked from afar. Yep, digest that one) he appears interested in the broadcasting newbie. 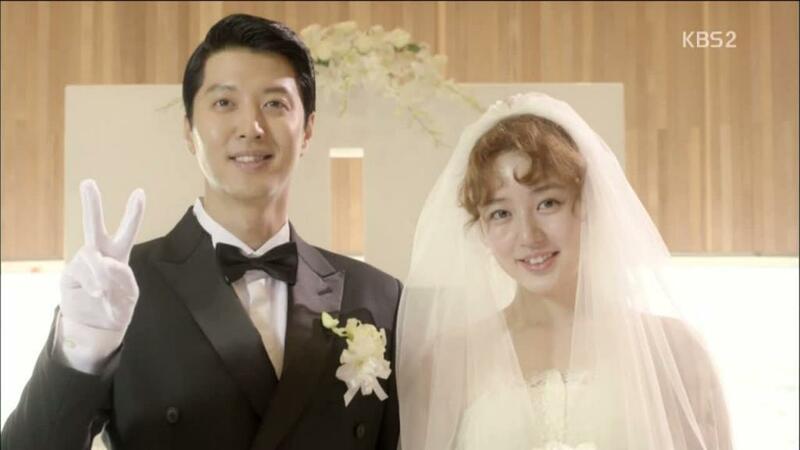 Future Mi Rae returns to the year 2013 in order to change her life, more specifically stop her marriage to Kim shin. Her motivations, other than the obvious stop the marriage are mysterious. Was her marriage to Kim Shin that terrible? Why does she keep saying that Kim Shin killed the one she loves? Questions, questions. Who would have thunk a future version of our heroine would be so confusing! Na Mi Rae is a bit of a failure (in her own eyes); her friends have found a measure of success while she is stuck with a job in a call center. All of that changes when she meets an Ahjumma…who claims to be her future self. Mi Rae, as any reasonable person would, reacts with disbelief and a mad suspicion that “I am you in the future” ahjumma is cray cray. That is until ahjumma proves (through knowledge only Mi Rae would know) that she is in fact future Mi Rae making a trip back in time. Future Mi Rae embarked on a time jump in order to stop herself from marrying Kim Shin, who apparently had a hand in the death of the one she loves. Present day Mi Rae is a bit resistant to future Mi Rae’s grand plans to hook her up with someone suitable. Through several random and unexpected occurrences present day Mi Rae ends up working at the broadcasting station with the man she is absolutely not supposed to marry. Joining Mi Rae and Mr. Don’t-marry at the broadcasting station is Mi Rae’s Oppa as well as Park Se Joo (the son of the broadcasting stations owner who is working as a VJ without anyone knowing his heir identity). Se Joo and Mi Rae run into each other a time or two and the signs of a major crush on Se Joo’s part are evidentiary. Meanwhile, Mi Rae is close enough to the wrong guy to cause future Mi Rae to worry. What is a time traveling woman trying to stop her past in the face of fate supposed to do! Aishhh! Oh time travel. How you remind me of every other show that came out in 2012. From time traveling doctors to time traveling scholars to time traveling jumpsuit wearers, Korean Dramas have given viewers their fair share of year jumping heroes and heroines in the last two years. This show presents a concept we have seen before, travel back in time to change the past (I mean, come on, Back to the future kind of nailed it three decades ago while the K-drama Nine gave a stellar look at the premise this past spring). But what matters is not that we have seen this premise before, it is if this show offers a unique take on the idea. So far Marry Him has played the setup nicely, with an ahjumma future version coming back for a pretty selfish (or seemingly selfish) reason – to change her own love life a save the one she loves. Of course saving the one she loves sounds noble, but I have a sneaking suspicion she is trying to save her dear friend from something that was unavoidable to begin with. Her real issue is coming to terms and understanding what had happened – not needing to jump backwards to fix it. As far as I can tell Marry Him if you Dare has two best friends – irony and fluff. Irony because no matter how hard future Mi Rae tries, her plans always lead current Mi Rae back to the place she should-not-be (or at least according to future Mi Rae’s opinions). Fluff because this show has its fair share of fluffy and cute rom-com moments, sweet and sticky scenes that ensure that this drama is true to its genre. The ironic parts are kind of face palm inducing, and unfortunately in two episodes feel predictable. Future you instructs you to not, I repeat, do not do x! So, you end up doing it any way. Yep- fate is fate. I get it. The fluffy and cute part is more enjoyable, at least where Yoon Eun Hye is concerned. After the tear fest that was I Miss You I am happy to see her back in a Rom-Com, doing what she does best. Perhaps I am thinking too deeply into this series at such an early point in its broadcast; I would not doubt that this is the case since I love to over analyze things. Whether I am way off the mark or spot on, I am interested to see how this show unfolds. In other words, you will find me (just me, future me has not shown up yet to tell me what to do *cough write for a Korean variety show cough*) tuning in next week. Cheers! Don’t know why but I feel Future Mi Rae is dead and blames late husband for her death. Ohhh, that would be interesting (and she did say she loved herself the most, so it would make sense)! I am trying to figure out what exactly future Mi Rae is getting at: I have wondered if her hubby committed suicide or (based on the subs I read) got into a car accident with either unnie writer or unnie broadcaster. I am still unsure, but it seems like future Mi Rae is trying to change what she should accept. I think maybe her brother is the one who gonna die. He is the only one she love at the moment. Yeah, I can’t quite figure out what future Mi Rae is thinking. 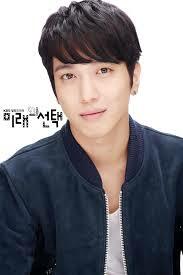 Because, she keeps calling Kim Shin ‘yeobo’ and apologising (to the picture she has of him). So, she still loves him. But then she was yelling at him and unintentionally making him think young Mi Rae is a con artist, lol. I have no idea what’s going on. Future Mi Rae is actually my least fave character so far, whenever she’s on screen I just want to get back to the others. I like all of the other characters, especially Se Joo; Yonghwa is actually fitting in, despite the fact that he’s clearly several years younger than the rest of them. The whole “yeobo” thing is confusing – I get the same vibe that she still loves him (which is why I am wondering if he committed suicide, because then he would technically have killed the one she loves- himself). I agree, future Mi Rae is my least favorite character as well, at least at this point. I get that her meddling is what is pushing the story but I just can’t get behind this character at this point.